Does Marketing Automation solve your “too much data” problem? I still remember the time when I started thinking about how to automate a number of the marketing activities in the company I work for. The term marketing automation was unknown to me, little did I know. We had no way of identifying all of these interactions (well, not always). I had no way of storing the marketing intelligence that these interactions brought me (now that’s where the challenge began). We had no way of actually converting these interactions into leads, or at least “micro-convert” them further along the buying cycle. And probably the biggest problem of them all: we had so many data and list from all these different actions, that it was extremely cumbersome and time-consuming to get them into a CRM system and actually do something with that data. Of course did I know about cookies on website, ID tracking in e-mails, and other techniques. But how do you track behavior across multiple channels? And finally he or she visits your website and downloads a whitepaper. Capture the fact that someone had interest in a webinar about a certain topic, market, or product. Link and store that he downloaded a whitepaper on a certain topic. Link and store that he subscribed to a certain mailing list. All this information would allow me to track his interest and MICRO-SEGMENT his interest. Based on this micro-segmentation I could build a descent segmentation of a particular buyer. And all of you marketers know that your buyers don’t like to fill in there contact details, and that they tend to fill in crap or dummy information. 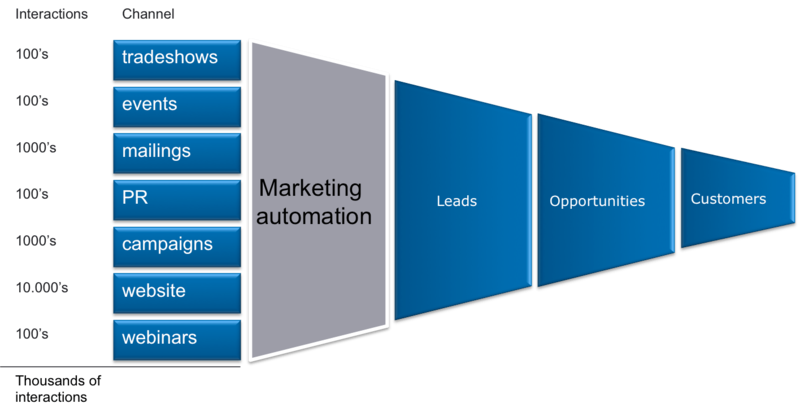 Bit by bit I started learning about an automation concept called marketing automation. Tracking and identification: each interaction is stored in a database, no matter the channel your buyer is using. All these interactions are usually not stored in your CRM database. Progressive profiling: because nobody likes completing forms on website, this system will not ask information to your buyers which is already in the database. But, it will ask information that is missing to further segment the buyer. Scripting & drip campaign: this mechanism can actually trigger new actions based on a previous action. For example, when someone clicks on a subject in an e-mail, and then doesn’t subscribe to a webinar, he/she can get an e-mail 2 weeks later giving him the recorded version of the webinar. Smarter systems will actually time the different campaign actions based on the behaviour of the buyer e.a. Does he react to a certain mail or not. Based on his reaction, the timing and action of the next campaign part will be different. Lead nurturing: sometimes, leads are not yet warm enough, and buyers just not ready to buy. The result is that an account manager will neglect the lead and forget about them. The concept of lead nurturing is capable of keeping that lead warm by regularly sending that lead information about his interest, and in that way keeping your company top of mind. What do all these concepts give me? Identity completeness: how well to we know our buyer. Responsiveness: how responsive is our buyer. A very responsive buyer is not necessarily ready to buy. Sales readiness: how sales-ready is our buyer. In general, you want to know if he has a budget, a timing to buy, a need, and a the authority to buy. Based on these 3 elements, a marketing automation system is capable of calculating when the time is right to start contacting your prospect. A lead manager, someone in your organisation, will then further qualify these leads and hand them over to the sales force or the sales channels. As with any automation, it will fail if you don’t have the right processes and organisation in place. In a previous post I have explained in detail when you are ready to step into marketing automation. But to end with the questions of this post : does it solve the “too much data” problem? Yes, I think it can. 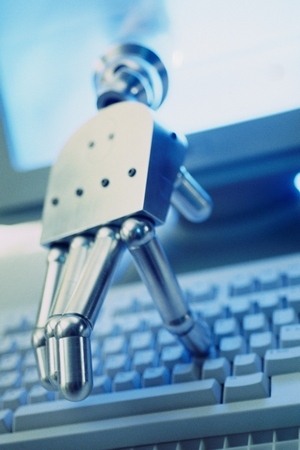 Marketing Automation is extremely powerful, and is part of the toolbox of modern marketers. That’s it. I would love to hear about your marketing automation adventures. Is there a CRM that can actually do all of these functions? I am a small business owner, but would love to have this capability from the start. Usually what happens is that you have your CRM system, which can be ‘in the cloud’ like SalesForce.com or on site, like Microsoft Dynamics. Then you would link a marketing automation system to your CRM system, which is in almost all cases “in the cloud”. I would recommend to keep as much as possible functionality of the marketing automation system in the cloud, and only transfer what is needed back and forward between the marketing automation system (like contacts, segmentation data, and leads). What systems to use is up to you. You could start by reading this : Gartner Magic Quadrant on CRM Lead Management. But I would advise to take a system like Hubspot or Pardot or others that focus on the small to medium business market. Marketo and Eloqua go higher, and are also much more expensive, although some of these large players also have SME versions. I looked at Salesforce and just couldn’t excuse paying for how bloated it seemed. I am currently using Solve360, but have looked at InfusionSoft based on a recommendation by a fellow financial planner. It i my understanding that a service like Hubspot would integrate with my current CRM, not replace it. Is this correct? Thanks for the great post and follow up. You are correct in your assumption that marketing automation cannot replace your CRM. Referring to Tom’s graph above, leads and opportunities you would typically manage within your CRM system. Marketing automation can feed your CRM with data. You could compare your marketing automation system as the place where you interact with contacts and collect bits of data on them (name, e-mail, company they work for, etc.) and their interests (the webpage they look at, the docs they download, webinars they participate in, videos they watch, etc. => see Tom’s blog post. There are CRM systems which are currently developing their own marketing automation solution in order to offer a complete solution (like SAP). Although these often have to catch up with existing platforms like Hubspot.